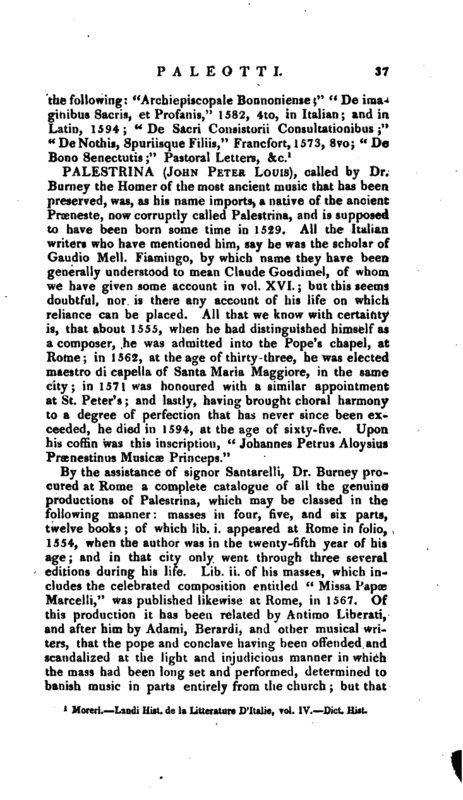 By the assistance of signor Santarelli, Dr. Burney procured at Rome a complete catalogue of all the genuine productions of Palestrina, which may be classed in the following manner: masses in four, five, and six parts, twelve books; of which lib i. appeared at Rome in folio, 1554, when the author was in the twenty-fifth year of his age; and in that city only went through three several editions during his life. Lib. ii. of his masses, which includes the celebrated composition entitled “Missa Papse Marcelli,” was published likewise at Rome, in 1567. -Of this production it has been related by Antimo Liberati, and after him by Adami, Berardi, and other musical writers, that the pope and conclave having been offended and scandalized at the light and injudicious manner in which the mass had been long set and performed, ^determined to banish music in parts entirely from the church; but that | Palestrina, at the age of twenty-six, during the short pontificate of Marcellus Cervinus, intreated his holiness to suspend the execution of his design till he had heard a mass composed in what, according to his ideas, was the true ecclesiastical style. His request being granted, the composition, in six parts, was performed at Easter 1555, before the pope and college of cardinals, who found it so grave, noble, elegant, learned, and pleasing, that music was restored to favour, and again established in the celebration of sacred rites. 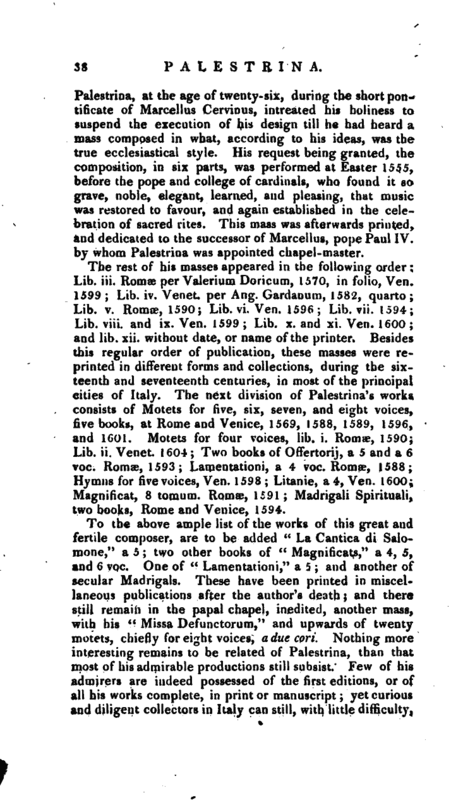 This mass was afterwards printed, and dedicated to the successor of Marcellus, pope Paul IV. 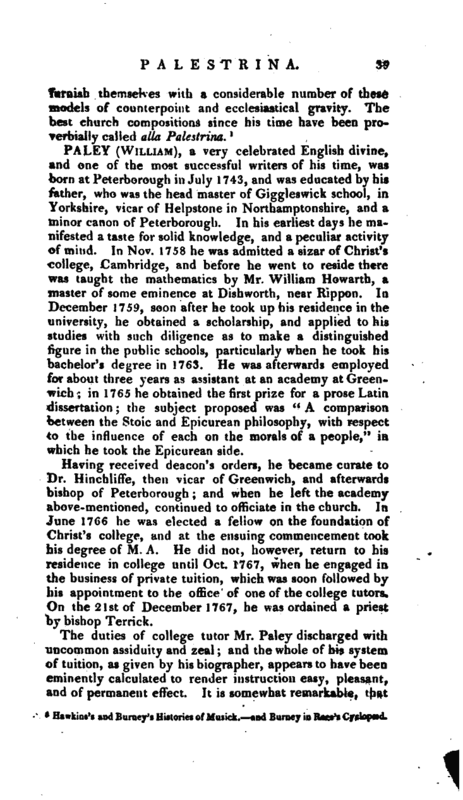 by whom Palestrina was appointed chapel-master. The rest of his masses appeared in the following order; Lib. iii. Romas per Valerium Doricum, 1570, in folio, Ven. 1599; Lib. iv. Venet. per Ang. Gardanum, 1582, quarto; Lib. v. Romae, 1590; Lib. vi. Ven. 1596; Lib. vii. 1594; Lib. viii. and ix. Ven. 1599; Lib. x. and xi. Ven, 1600; and lib. xii. without date, or name of the printer. Besides this regular order of publication, these masses were reprinted in different forms and collections, during the sixteenth and seventeenth centuries, in most of the principal cities of Italy. The next division of Palestrina’s works consists of Motets for five, six, seven, and eight voices, five books, at Rome and Venice, 1569, 1588, 1589, 1596, and 1601. Motets for four voices, lib. i. Romae, 1590; Lib. ii. Venet. 1604; Two books of Offertorij, a 5 and a 6 voc. Romge, 1593; Lamentationi, a 4 voc. Romae, 1588; Hymns for five voices, Ven. 1598; Litanie, a 4, Ven. 1600; Magnificat, 8 tomum. Romae, 191; Madrigali Spirituali, two books, Rome and Venice, 1594. Hawkins’s and Burney’s Histories of Musick. and Burney in Rees’s Cyclopeed.